Vietnamese youth find there is more to Switzerland than snow-covered Alps, luxurious watches and good chocolate. The country also offers the best hospitality education in the world. Hồng Minh reports. As more and more Vietnamese students choose to study abroad every year, their horizons are widening to include unlikely destinations, far away from mainstream places like the US and the UK. When 18-year-old Lê Thị An Khanh left her family in HCM City and took a long flight to Montreux in Switzerland three years ago, she had no idea what to expect. There were not many peers who could fill her in. Today, Khanh has finished six of her seven terms, and thinks she made the best choice of her life when she opted to study hospitality management at the Hotel Institute Montreux (HIM). The “average” tuition range for foreign students, compared to other institutions in Switzerland, and the offer of a discount owing to the fact that the family owned a hotel, were factors that helped Khanh choose the school. “Learning here has changed me. My perception and views have widened,” Khanh said, adding having people from over 110 countries on the campus taught her a lot of soft skills and engage in intense social networking. The icing on the cake was the hotel-like campus with a direct view of Lake Geneva and the breathtaking backdrop of snow-covered Alps. Unlike Khanh, Nguyễn Xuân Linh, 25, has no family ties to the hospitality industry. He share’s Khanh’s feelings about having made a great choice to study finance management in Switzerland at the Swiss Hotel Management School, which is located in the idyllic, mountainside village of Caux. Linh, in his second year, is enjoying life on campus, with castle-shaped buildings that evokes images of a Harry Potter world. 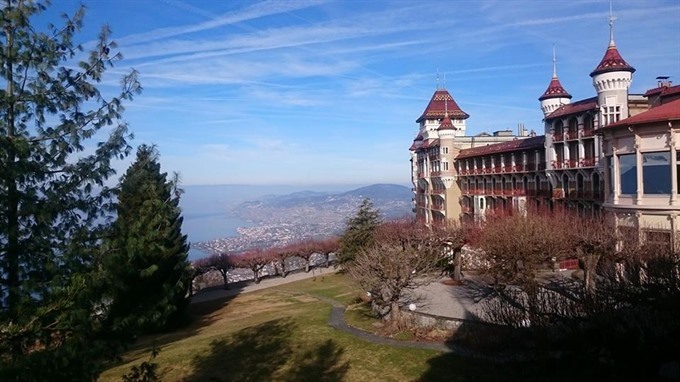 From the historic 1902-built Caux Palace, Linh and his friends can watch the Swiss Riviera and relax after classes. “Studying here in the Caux Palace campus gives us a peaceful learning environment. The social life is also great, with international students from more than 80 countries,” Linh said. In increasing numbers, Vietnamese youth are discovering the value of studying in Switzerland, long renowned for top notch hospitality education. According to the Swiss Education Group (SEG), a leading hospitality education group in Switzerland, some 69.2 per cent of the foreign students are from the greater Asia-Pacific region, and the numbers from Việt Nam have been increasing. The group welcomed the first Vietnamese students in 1998 and since then, 30-40 go there every year. SEG has five schools, the Hotel Institute Montreux, Swiss Hotel Management School, IHTTI School of Hotel Management, Cesar Ritz Colleges and the Culinary Arts Academy, which train students in buildings that used to be hotels – the perfect setting. The students get to stay in real hotel rooms with eligibility to enjoy luxurious rooms based on a “first come, first served” basis. “Studying in schools which are exactly like five-star hotels is the perfect way for students to learn by doing. It is a real professional experience,” said Linh. Besides the traditional school equipment, students enrolling in SEG schools are given iPads upon admission so that they can use e-books to study. Like other international campuses, there are a variety of sporting options to keep oneself healthy and fit. The good facilities also require students to put in serious effort in all areas. Linh, focusing on finance, said all students have to learn everything, from the basics of fine dining, in the first year to theoretical studies in management, finances, marketing and all related subjects. “Before coming here, I knew nothing about setting tables, arranging the dishes, forks and spoons. I had not even thought about the importance of making beds and rooms. I had to learn all that from scratch,” he said. During their undergrad days, students get involved in organising and hosting banquets, tea parties and making cocktails. It is also good for students to learn a second or even third foreign language besides English, so that they can get opportunities for internship every year. Getting paid internships every academic year is also a part of the “learning by doing” method followed at SEG colleges. The students can find the opportunities by themselves or consult their schools. To further support the students, the International Recruitment Forum is held every March and October, and 300 representatives of over 130 international companies working in hospitality industry meet and interview students at these invents. Linh said that his internships at restaurants and hotels in Switzerland and Belgium helped him understand the industry much better. Trần Ngọc Hằng, a third-year student at the Neuchatel-based IHTTI School of Hotel Management, also said that getting an internship was not just a challenge, but a huge opportunity, that could open doors wider to a career. Because she scored well during her second year, Hằng was given an internship at the five-star Beaches Negril Resort and Spa in Jamaica. “While most interns are normally assigned to the food and beverage or housekeeping section, I was lucky to be in cross-training, which allowed me to learn a lot and gain experience in different sections during internship,” Hằng said. She did not just improve her hospitality skills, she also got acquainted with Caribbean culture. In her third year, Hằng got a paid internship at an office of the world’s leading concierge service, Les Concierges John Paul, in Miami, Florida. For doing well, Hằng was also given an important role in the students’ association and was selected to represent her school at One Young World, a preeminent global forum for young leaders aged 18-30, in Ottawa, Canada, last year. “I have to say that studying here has opened up a lot of great opportunities for me,” Hằng said. Chu Minh, a graduate from the Swiss Hotel Management School in 2008, said the skills he learned at his school, like multi-tasking and “thinking globally” have added great value to his previous experience in finance and economics, leading him to important positions in hospitality groups after returning to Việt Nam. He now runs the Hospitality Tourism Solutions Group. “For students who are considering studying hospitality, I would tell them that it is the industry of the future. It offers fast growth, a challenging and dynamic working environment and many promotion opportunities,” Minh said. “So this is worth engaging and investing in. Identify your goals in advance. Set up your plans carefully. Choose the best school for your study. Finally, always think positively,” he said. Khanh, studying at the Hotel Institute Montreux, said her first internship in a South Korean restaurant in Geneva helped her earn more than 2,000 Swiss franc (around US$2,000) a month. Her second internship was with Sofitel Sài Gòn Plaza, for which she received just $50 a month.